This 2 days Uganda wildlife tour takes you to the most peaceful and nearest National Park from Kampala; Lake Mburo National Park Uganda. This park is a thrilling magical home to Uganda’s prestigious wildlife gem. Lake Mburo National Park is situated in western Uganda along the Kampala-Masaka-Mbarara highway, approximately 235km from Kampala that you will drive in about 4 hours. You will break your journey with a stop over a the Equator in Kayabwe and for Lunch in Mbarara at Igongo cultural centre. You will undertake a game drive in the park and an afternoon boat cruise along the park’s historical lake after which it was named. 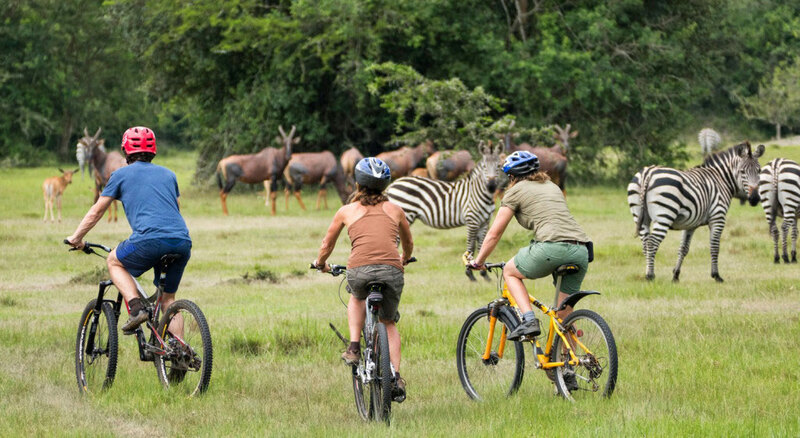 Lake Mburo National Park has lots of exciting activities to do as you explore the park including game drives, nature walks, horse riding, boat cruise, biking, bird watching to enjoy while in this park. Accommodation in Lake Mburo National Park ranges form luxury, mid range and budget depending on your choice. 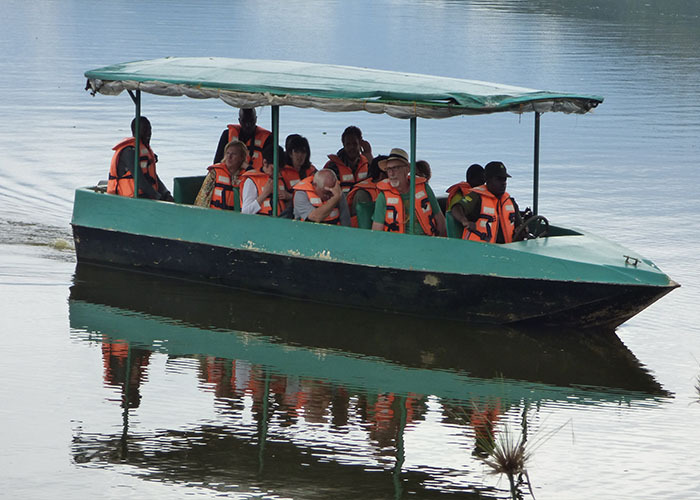 Day 1: Transfer from Kampala to Lake Mburo National Park for a boat cruise and game drive. You will have a stopover a the Equator in Kayabwe and En route for Lunch in Mbarara town at Igongo cultural center. You will be picked from the destination of your choice by our Uganda safari guide. If you are arriving through the airport at Entebbe, you will be welcomed by your safari guide and then start your journey/transfer you to the Park. While driving to the park, your driver guide will make a stop over at the Equator for photographs and also do a polar water experiment and lunch in Mbarara at Igongo cultural center. After lunch, you will depart for your afternoon boat cruise where you will encounter several hippos, crocodiles, other wild gem and birds. 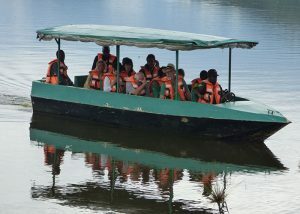 This boat is very nice for people on Uganda birding safaris as well as Uganda wildlife safaris since you get chance to see a lot of birds and animals as they quench their thirst in Lake Mburo. After the boat cruise, you will have a short game drive as you proceed to your chosen lodge/hotel in the evening for dinner and overnight stay until the following day. 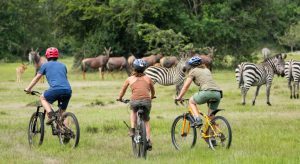 Day 2: Go for a horse riding safari and an afternoon game drive and then Transfer back to Kampala / Entebbe or at your area of stay. Wake up early in the morning and take breakfast at the lodge. Your driver guide will pick you at the lodge and then depart the lodge for your preferred morning activity. Horse riding starts early in the morning between 8 and 9am. This is an interesting activity that doesn’t require a skilled person because it can be done by anyone. Horseback riding is done for about 3-4 hours. This is one of the best activities in the park that gives you chance to get close to the animals. You will return to your lodge for refreshment and lunch after which you will proceed for your last game drive. The Lake Mburo National Park game drive adventure will enable you take lots of photos of the wild game found in Lake Mburo National Park. During game drives, tourists see variety of birds as well animals found with in the park for example the elands, impalas, antelopes and giraffes. Game drives are one of the best activities enjoyed by tourists on Uganda wildlife safaris. After all your activities, you will transfer back to Kampala. Drop-off will be at your hotel in Kampala or Entebbe airport for your onward flight.